A curious reader in Germany asked about the image in my blog “header” — what icon it is from, who the figures are, and what the inscription on the scroll means. Prepodobnuiy Ioann Damaskin — Venerable John of Damascus. 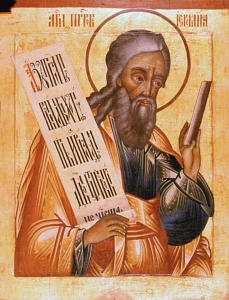 The Canon of the Resurrection was written by John of Damascus. The scroll just below the angel is the Stikhera, tone 2 from the Moleben to the “Joy of All Who Suffer” icon. So that is the origin and significance of the present “header” image on this blog. Do you notice anything strange about the icon shown here? Obviously it is an icon of Mary and the Christ Child, but look at the hands of the Mother. Now do you see it? She has three hands! The answer is very simple. Painters misunderstood and misinterpreted the original Greek icon on which huge numbers of hand-painted copies were based. While it is true that the original icon had three hands, only two of them were intended to be Mary’s hands. That is something that the process of copying the icon repeatedly changed, just as repeated copying of the Hebrew and Greek texts of the Bible resulted in great numbers of changes and variations in readings. But how did the original icon come about on which these huge numbers of peculiar copies were based? Well, all we have is the traditional origin story. That tale is as strange as the Russian image itself, and to examine it more closely we need only to look at another Russian icon — this one late 19th century — depicting the “origin story” of the Three-Handed Mother of God icon. We see, in the background, the “original” icon of Mary that gave rise to this legend. It is said that John of Damascus, who was the leading proponent of icon veneration in the Church against the opposers — the iconoclasts — was in the employ of a powerful Caliph. The Byzantine Emperor Leo — an opposer of icon veneration — supposedly had letters forged in John’s handwriting, urging Leo to attack the Caliph. These were made available to the Caliph, who on seeing the forgeries, believed them to be genuine. He decided to punish John for his presumed disloyalty, ordering that his hand be cut off as punishment. In this rather gory icon, we see John of Damascus, with his severed hand lying on the ground, and blood flowing freely, praying before an icon of Mary. According to the tale, because of his prayers before the icon, Mary healed John by miraculously re-attaching the severed hand. In gratitude for this miracle, a silver image of the severed hand was affixed to the icon itself. If you look closely, you will see that this “origin story” icon has condensed the story so that we see not only John with his severed hand, but also the silver hand already attached to the image (which actually happened later). Icons frequently push two or more events together into the same image, ignoring chronology. So that is the peculiar origin story of the original “Three-Handed” icon of Mary. And as already mentioned, misperceiving that silver hand for a third hand of Mary in the process of repeated copying is what gave us so very many Russian icons of Mary with three hands. Images that show the “added” hand as not that of Mary are actually uncommon in Russian icon painting. One sees from this how easily folk tales become spread, and how mistakes get incorporated into the icon painting tradition, becoming tradition in themselves. We see in the “origin story” icon of John of Damascus the ornate painted and embossed border so typical of countless Russian icons painted in the late 19th and very early 20th century. The style of this icon is very Westernized, in the more realistic manner preferred by the State Church and abhorred by the Old Believers, who kept generally to the old stylized “abstract” manner of painting figures and backgrounds. But what about the real origin of the silver hand on the original icon? Well, the “true believers” would not question the origin story, but for the rest of us, it is far more likely that someone with an affliction of the hand once did pray before the icon, and when the hand got better, he or she had a silver hand made and attached to the image in thanks. This is a common practice in many Marian shrines, including those of Roman Catholics. There one sees little silver body parts of all kinds attached to or placed near images of Mary. They are generally referred to by the Latin term “ex-voto,” meaning something resulting from a vow — in this case little silver objects offered in gratitude for perceived answers to prayer.